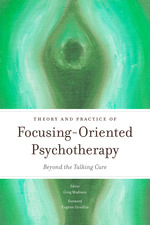 This comprehensive introduction to Focusing-Oriented Psychotherapy lays out the background and fundamentals of the approach covering theory and practice. Gendlin, after many articles on Focusing-oriented psychotherapy, finally published the text Focusing-Oriented Psychotherapy in 1996, making these ideas more widely available to the world. With contributions from some of the world's most influential contemporary Focusing-Oriented Psychotherapists and a foreword by Gendlin, this book provides a long overdue survey of this growing field. It explores how Focusing has been integrated with other theoretical orientations such as attachment theory, solution focused therapy, relational psychoanalysis, and existential therapy. Contemporary issues in Focusing-Oriented Psychotherapy are also covered, such as its suitability across cultures, and how it relates to the latest findings in the field of neuroscience. The book is essential reading for all practicing therapists and counselors, as well as trainee therapists, particularly those who want to explore the potential of experiential dimensions in their therapy and coaching practice. Jessica Kingsley Publishers also publishes a companion volume, Emerging Practice in Focusing-Oriented Psychotherapy: Innovative Theory and Applications, edited by Greg Madison.